Remember last fall when I showed you how to plant tulip bulbs? Well, ladies, look what has bloomed. A bounty of pinks; dark and light. With a little effort in the fall…. I have a beautiful tulip border that brings me such joy when I look at it. You do not have to worry…. I will remind you to plant these beauties next fall. I paid $24 for 125 bulbs and planted 250 bulbs in less than an hour. 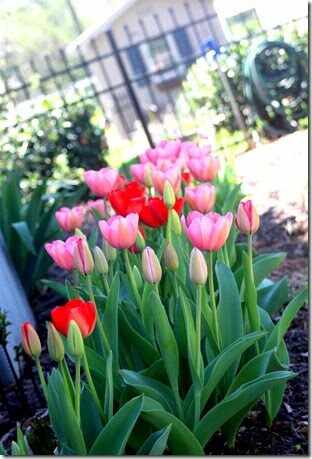 Your tulips are so pretty!! They are beautiful. I'm going to definitely plant some in the fall!! I followed you and planted tulips when you did. They are blooming now in Texas. However, my mixed sack ended up being purple, yellow and red. Next year I only want to plant pink. I am glad you will remind me. I want to plant even more next year! I would love to share a picture! Oh Andrea, Share a picture!!! I would love it. They are beautiful. I have wanted to plant bulbs for many years but never get around to it in the fall! They are so beautiful!!! I hope one day to be able to plant some bulbs to enjoy the beauty in the spring. Glad you found me again! Beautiful and so worth it! I took pictures of my tulips, but I don't know how to share them. I do not have a blog. Cynthia, these are wonderful. I love tulips- they are one of my favorite. I don't have any tulips right now. We took out our big flower bed last year, and I have not re planted. I miss them so much. But I can thoroughly enjoy your beautiful flowers. Thanks! Send them to me and I will highlight them!! !